Home RPG News Adventurers!, Time Travel, a Storyteller’s Thesaurus, and More! Raging Swan Press has released a compilation set of their Village Backdrop supplements for Pathfinder as a single offering in their latest GM’s Miscellany: Village Backdrops [view our entry in the Roleplayers Chronicle Reference database here]. “Village Backdrops are short, richly detailed supplements that each present a single village ready to insert into almost any home campaign. Perfect for use as a waystop on the road to adventure, as an adventure site themselves or as a PC’s home, Village Backdrop present the details so the busy GM can focus on crafting exciting, compelling adventures.” Written by John Bennett, Creighton Broadhurst, Eric Hindley, Ben Kent, Greg Marks, and Marc Radle, it’s available for purchase from DriveThruRPG: GM’s Miscellany: Village Backdrops. First Ones Entertainment [visit their website here] has released their latest NeoExodus Legacies, organized play adventure module Slavers of the Dominion. “Grokfa Polina Vlaklova, a powerful noblewoman, needs help taking down a group of slavers that have been plaguing the Protectorate’s western border. All you need do is offer yourself as slaves and find out who is the leader of the cartel.” Written by JP Chapeleau, it’s available for purchase from DriveThruRPG: Legacies: 92-LS-01 Slavers of the Dominion. Necromancers of the Northwest [visit their website here] has released their latest Exotic Encounters supplement for Pathfinder, featuring Dryads. “This particular installment of Exotic Encounters focuses on the dryad. These tree-bound women of the woods are longtime favorites of the fantasy genre, and can easily serve both as quest-givers and allies, but also make for excellent villains and other obstacles. Rather than create dryads at a wide variety of CRs, this Exotic Encounters does things a little differently, and provides three very different styles of dryad that all appear at the same CR” Written by Alex Riggs and Joshua Zaback, it’s available for purchase from DriveThruRPG: Exotic Encounters: Dryads. Dreamscarred Press [visit their website here] has released another Psionic Item of Legend – Groundscorn Boots. “Within this short book you will find the history of the Groundscorn Boots, the requirements to attune a character to it, and the abilities of it. In addition, the rules of legendary items are detailed.” Written by Eric Hindley, it’s available for purchase from DriveThruRPG: Psionic Items of Legend: Groundscorn Boots. Troll Lord Games [visit their website here] has released the second installment of the Tome of the Unclean bestiary series for Castles & Crusades. “Under a sky of blue, lies our vibrant world, where life blossoms in the green spring, or lays in repose in red autumn. But beneath the green, beneath the red, lies the cold, hard ground. Here the roots of things cut the earth, devouring what it holds. Small creatures dig and burrow and worms grow fat on the still dirt. Deeper still lie subterranean worlds, caves, where rock crawls upon spirals of time, creeping from pools of quiet that lap the shores of darkness. And beyond the darkness, beyond all sense, lies a gulf of empty fear, where our demons lurk.” Written by Kim Hartsfield, it’s available for purchase from DriveThruRPG: Castles & Crusades Tome of the Unclean Issue No. 2. GRAmel [visit their website here] has launched their new time travel setting for Savage Worlds – TImeZero: Operative’s Manual. “TimeZero is the new, exciting time travel setting from Gramel. In this setting you will play as a trained Operative, a member of TimeGuard, the secret organization that fights time crimes along the continuum. Time thieves, chronoterrorists and many other incredible dangers await you across the millennia of human history! You need this book and a copy of the Savage Worlds core rules to play this game. It is divided into two parts: the Player’s Guide, where you’ll find background details and rules for quickly creating time-cop agents, and the Game Master’s Guide, containing advice on running a time travel game, how to design your time-travelling adventures and a selection of time travelling opponents.” Written by Umberto Pignatelli, Andy Slack, and Piotr Korys, it’s available for purchase from DriveThruRPG: TimeZero: Operative`s Manual. Onyx Path Publishing has released another preview of the upcoming V20 Dark Ages core rulebook, with a look at the Tremere clan. “We have some subtle theme and mood shifts from Vampire the Dark Ages, to Dark Ages: Vampire, to V20 Dark Ages. I think our Tremere nickname does a lot to evoke my vision for V20 Dark Ages. One of their nicknames is familiar, “The Usurpers”. That’s a classic, it has a lot of gravity. But the new nickname addition, “Tremori,” or “The Trembling Ones”, I think says a lot about the attitudes of the time. It also teases at an etymology for the clan’s name, which I’m a total nerd for. I think our writer, Geoffrey McVey, did a great job of presenting the clan in a familiar but fresh light. On actual clan names, there’s only been one that’s changed, and it’s subtle. The Giovanni of V20 Dark Ages are The Giovani. Essentially, they’re called “The Young Ones” in Italian.” Download the Tremere preview here. Xion Studios [visit their Facebook page here] has released their latest WatchGuard solo super for Mutants & Masterminds – Tundra. “Never-before-available in any format! The newest release from Les Supérieurs corner in the WatchGuard Universe! Obsessive historian Marie Devereaux gets herself mixed up in some mystical mess and now she uses her newfound abilities to stir up trouble in Parts North of the WGU while pursuing her obsessions as Tundra! !” Written by Steve Perrin, Charlie McElvy, and Leon Chang, it’s available for purchase from DriveThruRPG: WatchGuard Solo – Tundra (M&M 3e). Peryton Publishing [visit their website here] has released a new adventure module for 4 – 6 PCs – Death at Grimwood Hall. “People will do strange things for love, but Margaret Grimwood of Grimwood Hall is going to take that to a whole new level. In the sleepy town of Meanderwood something stirs in the darkness. Under the moonlight a glint of steel flashes. Two shadowy figures emerge from the graveyard carrying something on their shoulders.” Written by Scott Malthouse, it’s available for purchase from DriveThruRPG: Death at Grimwood Hall [Tunnels & Trolls]. D101 Games [visit their website here] has released a new sword & sorcery adventure for their Swords & Wizardry setting Crypts & Things – Tomb of the Necromancers. “The ruins of the Unknown City stand at the edge of the Death Wind Steppe, surrounded by the foothills of the Wolf Head Mountains. They are a monument to a once mighty city. Few now know the city‘s history, and how it fell. The city‘s old name, Tetronis, now belongs to a village of simple fisherfolk standing amongst the ruins. The force behind both the old city‘s greatness and its destruction was the god Orlusz.” Written by Paul Mitchener, it’s available for purchase from DriveThruRPG: Tomb of the Necromancers. Mystic Ages Publishing [visit their website here] has released a new space opera RPG – Foreign Element. “Humanity’s ambush push into the stars is halted with a mysterious event known as the Great Blackout. Thousands of colonies, space stations, and space craft go silent in a matter of days and weeks. Now, the Interplanetary Union is scrambling to discover what happened, sending out RX teams to diagnose the rot spread through known space.” Written by Nathan J. Hill, it’s available for purchase from DriveThruRPG: Foreign Element. 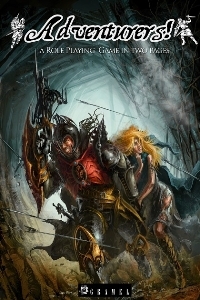 GRAmel [visit their website here] has released a new ultra-rules lite fantasy RPG called Adventurers. “Adventurers! is the new ultra-lite RPG from GRAmel. Made for Old School aficionados, it has a Player’s Guide and a Game Master’s Guide – each in only two pages!” Written by Umberto Pignatelli and Andy Slack, it’s available for purchase from DriveThruRPG: Adventurers. Omnihedron Games [visit their website here] has released an Arabian epic fantasy setting guide for their ERA epic storytelling game – Caliphport. “CALIPHPORT is the first setting pack for ERA: Epic Storytelling Game. Caliphport is a golden city surrounded by mysterious desert and home to kings, pirates, brigands, slaves, sorcerors and djinn. Add some ‘Arabian Nights’ to your ERA games and challenge your Legends to a new experience.” Written by Neil Gow, it’s available for purchase from DriveThruRPG: ERA: Caliphport Setting Pack. Mayhem in Paper [visit their website here] has released this week their latest set of Fantasy Adventure paper miniatures – Witches & Bats, Zombie Villagers, Reptilian Monsters, and Skeleton Soldiers. ” Set of 6 wicked witches, 4 giant bats and 1 small bat swarm for your spooky theme games. These are a great addition to any range of Halloween themed figure sets and are perfect for any fantasy horror games. “ Designed by J. Hartman, they are all available from DriveThruRPG. Troll Lord Games [visit their website here] has released a new reference book for those looking to tell just the right story in Storyteller’s Thesaurus. “Let this book inspire new characters and develop original settings and locales. You’ll be amazed at how quickly new ideas form as you browse. The Storyteller’s Thesaurus just might be the cure for writer’s block, dull prose, and stale ideas ~ pick up this book and let your world expand!” Written by James M. Ward and Anne Brown, it’s available for purchase from DriveThruRPG: Storyteller’s Thesaurus.